'View of Bombay Harbour, taken from the Island of Colaba'. Uncoloured lithograph by W. Watson from C. Head's Eastern and Egyptian Scenery London, 1833. Printed by C. Hullmandel. bl.uk > Online Gallery Home	> Online exhibitions	> Asia, Pacific and Africa Collections	> 'View of Bombay Harbour, taken from the Island of Colaba'. Uncoloured lithograph by W. Watson from C. Head's Eastern and Egyptian Scenery London, 1833. Printed by C. Hullmandel. 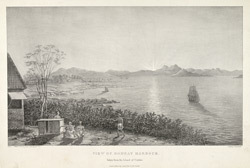 Lithograph of Bombay harbour by W. Watson after Charles Franklin Head from his 'Eastern and Egyptian Scenery' printed by C.Hullmandel and published in London in 1833. The area of Bombay was originally composed of seven islands separated by a marshy swamp. In 1661, the British Crown acquired the islands of Bombay from the Portuguese as part of Catherine of Braganza's marriage dowry to Charles II. From 1668, the East India Company developed the area as a trading port. The fort was situated on the island of Bombay. The island of Colaba, to the south, became a popular place for recreation in the 18th century and was connected to the island of Bombay by a causeway the 1830s.